Halong bay; the jewel in Vietnam's crown. No trip to Northern Vietnam is complete without visiting these gorgeously emerald waters; they truly are something else. Like many other destinations in South East Asia, Halong Bay is recognisable by towering limestone karsts - the sheer quantity is what makes Halong Bay particularly special. A UNESCO World Heritage Site, it is a popular tourist destination and therefore by no means a hidden gem. The vast majority of visitors experience and explore Halong by boat; a one or two night cruise. And naturally, there are a whole load of different options available! Of course, cruises vary depending on budget and there is pretty much something for everyone. What we heard from everyone we spoke to however was "you get what you pay for". Those who spent $50 per person told horror stories of rats on their boats, being forced to climb on to another boat in the middle of the night for a bed and tales of food poisoning and sickness. Other cheaper boats were essentially booze cruises with revellers partying until sunrise - mainly a younger crowd and more focus on drinking than seeing anything of Halong Bay. My god I sound so old. I used the word revellers. For us it was a little tricky; we wanted nice food, clean comfortable rooms and the chance to see as much as we could of Halong Bay, but we didn't have a huge budget and we also didn't want to find ourselves on a boat with the OAPs. So our research begun; and I warn you - it's a minefield! We settled on Halong Glory Legend after reading pretty good reviews and managing to haggle them down to $360 for the both of us for a three day, two night cruise. Glory Legend is a 'mid-range' option; apparently 4*. A word on reviews; be cautious. People are quick to complain and forget to judge things on what I'd call 'Asia standards' - as in, don't expect the health and safety record you'd get in the UK and remember that Halong Bay is a tourist trap. Some places will try and rip you off, and if something sounds too good to be true, it probably is! Friends of ours went with Ethnic Travel and paid around $150 per person for 3D2N, which went off the beaten track (quite rare!) but the boat was a little more basic than our cruise. We also heard that Fantasea were a good option; we were quoted $120 per person for 3D2N. Now this might sound like a lot of money - they are, particularly if you're backpacking. Do remember that this price will (usually) include transport to and from Hanoi which takes around 4 hours each way, all meals (breakfast, lunch and dinner) and excursions from the boat (kayaking, exploring caves). It's important to note that drinks are not included in the bill and they can be expensive; we were a bit cheeky and took a bottle of rum with us and just bought cokes which we topped up on the sly. There was no fridge in our room so we couldn't have kept mixers (or wine, beer) cool. It saved us a little bit of cash, at least! 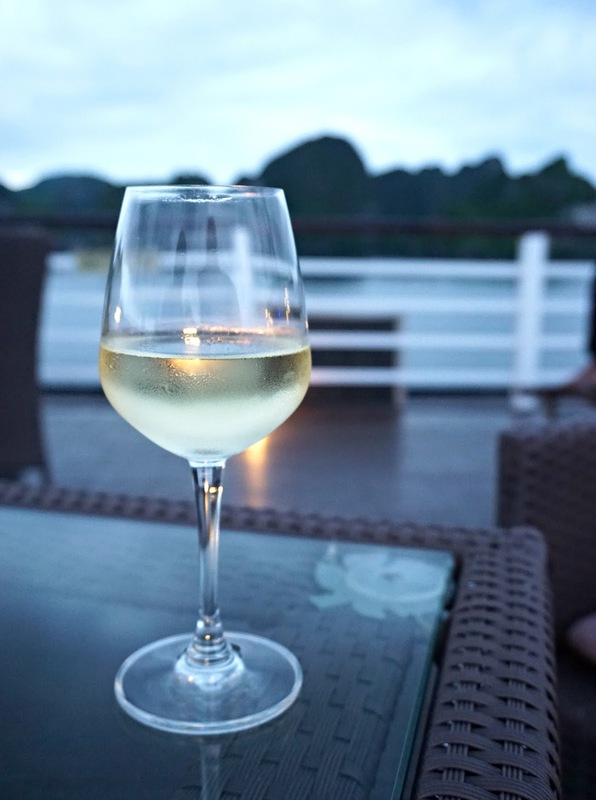 Our boat also held a happy hour each evening with 2-4-1 drinks which we made use of; there is nothing quite like the bliss of drinking a glass of chilled white wine whilst watching the sun set over Halong Bay. So what did we do on our cruise? Our three days were fairly jam packed; kayaking, climbing the steps to the viewpoint at Ti Top island, exploring hidden caves, more kayaking and swimming in a secluded cove, visiting Sung Sot ('surprise') cave and an oyster farm. It, at times, felt like organised fun, yes. There was always the option to chill out on the boat, but the kayaking was excellent and caves pretty spectacular. The crew on board were fab; for some reason they thought we were on honeymoon so on the second evening we were treated to complementary cocktails on the deck after dinner! There were rose petals on our bed on arrival, and they really made sure we were well looked after. The room itself was great; clean with a comfortable double bed, working air-con and a good shower. After hearing so many horror stories and tales of wasted money, we were so relieved to find our boat was nice! And leaving the most important until last; the food. We were fed well! As soon as we arrived on the boat and had been shown to our rooms, we were asked to take a seat in the dining room for lunch. And the seven courses commenced. Seven... I kid you not. The food was fresh, well cooked and delicious. As meat-eaters we were well catered for (seabass, oysters and steak to name a few), but the vegetarians on our table said the food wasn't quite to their taste - often a weird mix of carbohydrates without much protein. We certainly didn't go hungry during our three days on board however, with huge breakfasts, lunches and dinners. 1. Budget - this will be the biggest factor influencing the company you choose. As a rule, the more you spend the more luxurious your cruise. But pick wisely; make use of recommendations, read reviews and be wary of deals that sound too good to be true. 2. Reviews - worth a read, but take with a pinch of salt. In our experience people are far more likely to leave a review of a negative experience than a positive. We also found that some of the criticisms people had were downright ridiculous; don't write a company off just because of one person's unrealistic expectations. 3. Haggle - this should go without saying in SE Asia! Visit the booking office in person to get the best bargaining power, and stick to your guns. Walk away if they don't respond. 4. Watch out for scams - if it seems too good to be true, it probably is. 5. Know your aims - booze cruise? Relaxing break? Action packed? Off the beaten track? Have a think about this before you go to book to get the most out of your trip and avoid disappointment. 6. Don't get bogged down - there are so many options, it can become overwhelming! Try not to get stressed out by it all; decide what you want from it, do your research... make a decision and stick with it.